A while ago James commented on the podcast and asked for a segment explaining some of the metering tools we have available in DAWs. If you follow the podcast you may have already heard this info. Before we get into the DAW let’s briefly go over the way analog equipment is calibrated. Mic preamps, converters, hardware effect processors are all designed to work optimally at 0 VU. They can usually handle more than that before distorting, but 0 VU is where the signal to noise is best. VU stands for Volume Unit and is the oldest analog metering system. VU meters are relatively slow moving with at 300ms response time. This slow response of a VU meter better represents an averaged volume level close to how our hears work. 0VU is equal to +4dBu or professional line level. The dBu scale measures the analog voltage level in our equipment with 0dBu calibrated to about 0.775 Volts. The u in dBu stands for ‘unloaded’ which means that the voltage is measured with a zero resistance load. Again, 0VU or +4dBu is the ideal constant voltage of all your analog components in the recording and monitoring chain. Here’s an example chain – microphone, mic preamp, compressor, audio interface line input, Analog to digital converter, recording software. The microphone signal gets boosted up to line level by the preamp. Line level goes into and out of the compressor into the audio interface. The analog to digital converter assigns bits representing the voltage coming in and sends the data to your DAW. Once it’s in your DAW the level you see will not be 0 on your track meters, it will actually be closer to -18dBfs depending on the calibration. This may seem like a really low level but this is actually the optimal level that all the analog components that come before it. Once you build up your song with several other tracks, you’ll be happy you have that extra headroom and lower noisefloor. The dBFS meters show Decibels relative to full scale. Instantaneous digital levels below the 0dBFS absolute peak. When 3 consecutive samples pass 0 the clip light will come on. Now what’s left is RMS metering. Some DAWs have this in addition to Peak metering on the master. 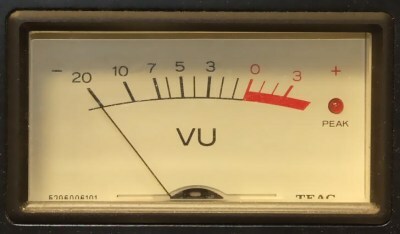 Similar to how VU meters work, RMS meters show an average level. The RMS value relates to how loud a sound is perceived. These days all music is mastered to peak just below 0dBFS, the unwritten standard is -0.3, but the song with the higher RMS level will appear to be louder. There isn’t a widespread calibration standard for RMS metering so you’ll have to compare values from a few references to what you’re working on. I recommend everyone get the free TT Dynamics Range meter. This is an extra large Peak and RMS meter in all plugin formats. I put this meter on my master right away and keep it open so I can always keep an eye on levels as I build the mix. I also highly recommend the Klanghelm VUMT plugin, well worth the money. If you’re interested in this stuff, dig into this site for much more detail. This is just the beginning, there are many more advanced and specialized meters available, these may be covered in a future post. Though, I have never been fond of DR’s TT Dynamics Range Meter. I use a pair of Dorrough 280-Ds, and also the Waves Dorrough Collection. So I a bit accustomed to that. But, perhaps I look at it again if I can fit it into how I work. I have noticed the more I work in pro audio, the less I upgrade because it just slows me down. Why have you never been fond of TT DRM Hakim? Whats its limitations? My favorite metering style is BBC PPM metering. Of course this is predominately applicable in broadcast studios, I got used to them. Now I tend to use the standard digital peak metering for mastering purposes for all their weaknesses. Whilst metering is useful I tend to rely on what my ears tell me rather than whats on a meter, meters are just another barrier between you and what you should be doing, i.e. listening. with a zero resistance load. I think you mean an infinate resistance load. A zero resistance load would be a dead short which would result in NO OUTPUT. I always thought that dBFS implicitly means “peak level”, and that the output of a 0 VU preamp with a sine wave was equal to “- 18 dBFS” (peak level). So I record at a peak level between -18 dBFS and – 8 dBFS (depending on the type of sound, almost 18 dBFS for sounds like bass or cello, higher for percussive sounds).